Play Lucky Draw by PowerCore to Win Free Toys! Would you like to WIN toys while you’re attending Five Points Festival? 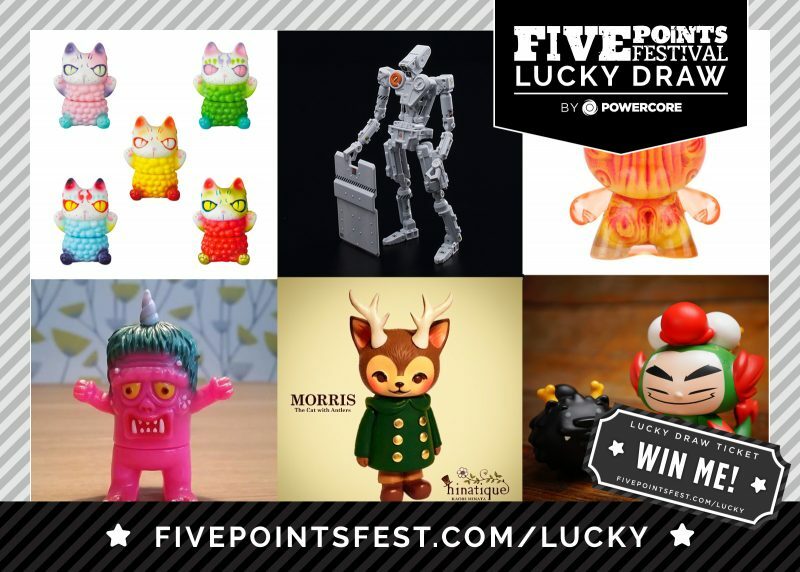 We’re excited to bring to you the Five Points Festival Lucky Draw Game in partnership with PowerCore where drawings for exclusive Designer Toys are announced LIVE on the shiny new Sweepstakes Page at https://fivepointsfest.com/lucky/ . Just open up your browser on your phone and play! Grab a Lucky Draw Ticket number now and watch the Prize List every hour of the festival to see winners announced in real time while you wander the floor! If your number is drawn, it will show up next to the prize and you’ll receive instructions on how to pick up your prize. We are proud to be working with some amazing Designers and Artists on this including 1000Toys, Yasu Ebineko, Hinatique, Martin Hsu, Rampage Toys & Luke Chueh! Lucky Draw is available to Festival Attendees only. Pick up your Festival Tickets here. You must be present to redeem your prize but you do not have to be at our booth during the drawings. Just check the Sweepstakes page at https://fivepointsfest.com/lucky/ and your email for announcements.